With the 116th Congress officially sworn in—boasting the largest number of women and other people of color in history—we have a vital opportunity to make sure more of our legislators are fighting for the digital rights of the most vulnerable Americans. On Jan 30 at 12pm EST, the Voices for Internet Freedom Coalition, including Team #MediaJustice, Free Press, 18 Million Rising, Color of Change and the National Hispanic Media Coalition, is hosting a Capitol Hill briefing for the newest members of Congress. 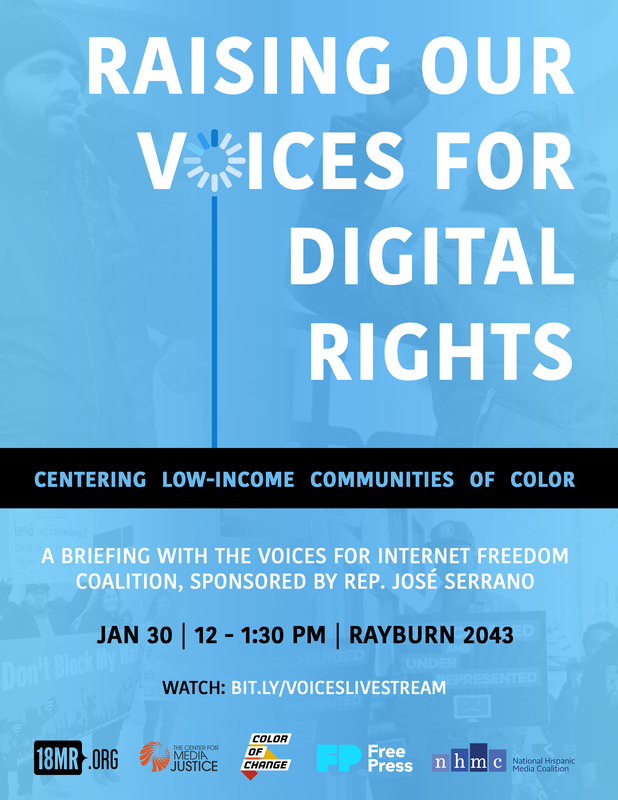 Sponsored by Rep. José Serrano, the briefing will highlight why net neutrality is a racial justice issue, the ongoing fight for affordable broadband services, and the urgency of securing our privacy online. Watch a livestream from the briefing on our Facebook page starting at 12pm ET, and follow @mediajustice on Twitter and Instagram all day for live updates. Join us in seizing this moment to demand our Congressional leaders protect our digital civil rights.